Karamanlis’s visit was followed by an even more tumultuous one three years later, when Georgios Papandreou met Lyndon Johnson. As it has often been, Cyprus was at the center of discussions between the Greek and American leaders. In the summer of 1964, Washington was attempting to convince Papandreou to accept what Athens saw as a partial partition of the island in return for a union with Greece. Johnson was unable to secure Papandreou’s agreement. It was 26 years before another Greek premier visited Washington but Constantine Mitsotakis struck up a rapport with George Bush Snr that Papandreou and Johnson could only have dreamed of. Despite being a quarter of a century later, the Cyprus issue still dominated the agenda. Mitsotakis took a young foreign minister with him on the busy five-day trip: Samaras. The diplomat, however, was left out of the meeting with Bush, as Mitsotakis’s daughter, Dora Bakoyannis, accompanied him instead. The following year, Bush Snr became the first US president to visit Greece in more than three decades. Five years later, Clinton went one better when he visited Athens and repeated, in Greek, Shelley’s famous line “We are all Greeks.” He topped this in the same speech by offering an acknowledgment of the US’s role in the 1967-74 junta in Greece. “The United States allowed its interests in prosecuting the Cold War to prevail over its interests–I should say its obligation–to support democracy,” he said, thereby attempting to bring closure to the cycle of events that followed Papandreou’s acrimonious meeting with Johnson 35 years earlier. Coming three years after the Imia crisis, when Clinton intervened to ensure Greece and Turkey did not go to war, the US president urged closer ties between the two countries, which by the time of his visit had been augmented by the so-called “Earthquake diplomacy” generated by deadly natural disasters in August 1999. As a result, Turkey and Cyprus featured less prominently when Simitis met George W Bush in January 2002. Peacekeeping in the Balkans and – in the post-911 era – counter-terrorism dominated talks, with a particular focus on Athens’s efforts to tackle domestic terrorists ahead of the 2004 Olympics. The Olympics were the key to Costas Karamanlis’s visit to the Oval Office in May 2004, when Bush probed him about the security effort, especially as Bush Snr was due to attend the Games. For once, there was little for the US and Greek leaders to discuss about the Cyprus issue as the Annan Plan for reunification had been rejected the previous month by Greek-Cypriots. 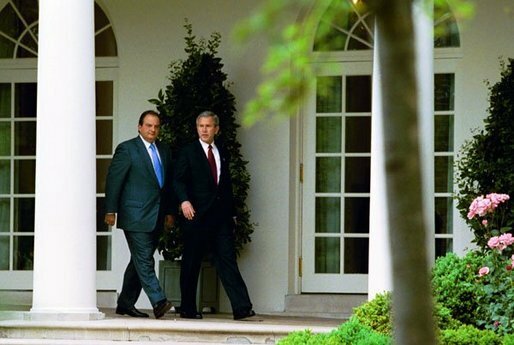 Karamanlis became the only Greek prime minister to pay an official visit to the White House for a second time in May 2005, when Bush thanked him for keeping his relatives safe at the previous year’s Olympics. Furthermore, a discussion about the rather vague “freedom agenda” meant that this went down as perhaps the least notable encounters between the leaders of the two countries. It was in rather more frantic circumstances that the next, and most recent, visit by a Greek leader to the White House took place as George Papandreou met Barack Obama in March 2010, two months before Greece agreed its first bailout with the EU and IMF. It’s safe to say that at that point the Greek government and people were not sure what was about to hit them and that perhaps the Obama administration, already carrying the experience of dealing with the US financial crisis, were a little more aware of the implications. Setting aside Hillary Clinton’s light-hearted suggestion that Greece should receive royalties whenever an election is held anywhere in the world, the US knew what was at stake in Greece and its potential consequences for the European and global economies. Obama’s Treasury Secretary at the time, Timothy Geithner clashed with eurozone leaders as he warned them about the “catastrophic risk” they were taking by failing to act decisively enough over the Greek bailout. Since Greek prime ministers began visiting the White House 67 years ago, the US was often seen in Greece as a bully on foreign policy issues – the elephant ready to flex its trunk. Over the last few years, though, the US has shown a more benign side on economic matters. By cajoling the eurozone, supporting loans for Greece through the IMF and expressing scepticism about Germany’s austerity recipe for overcoming the crisis, Washington has found itself more in step with the Greek government, and perhaps public opinion, on policy positions than at most points in history. Given that the IMF, where the US possesses a strong voice, urging the eurozone to consider further debt relief for Greece, Samaras has a sturdy platform for talks with Obama. This won’t be a single issue discussion, though. Other matters, such as energy, the eastern Mediterranean and Greece’s presidency of the EU, will also be broached. Nevertheless, there is reason for Samaras to believe this meeting has potential. Perhaps, though, the best guidance he could take from the history of meetings between Greek prime ministers and American presidents is to keep expectations as low as possible. This entry was posted in Diplomacy, Greece, Greek politics and tagged Andreas Papandreou, Barack Obama, Bill Clinton, Constantine Karamanlis, Costas Mitsotakis, Costas Simitis, Diplomacy, George Bush, George Papandreou, Greece, Harry Truman, John F Kennedy, US president, USA, Washington, White House. Bookmark the permalink. Greece epitomizes all that’s wrong with the EU. A failed union indeed. EURUSD parity by the end of 2015. The USA has been quietly consistent since 2010 on where it stands re Greece and EU policy. Jack Lew’s July visit to Athens surprised the EU. It sent out a little shockwave message of US interest/good will, and Samaras’ follow-up visit consolidates this. The August timing is more to do with a certain upcoming election, and given Greece’s low status and the needs of diplomatic theatre there is no need to over-egg the pudding by providing a Lunch. BTW Nick, you are happy to quote my father (Gerasimos Tsigantes aka PD Gigantes) but meanwhile I’m banned from commenting on Kathimerini? For which 3 generations of my family wrote articles? Admittedly, of course, for the Vlachos’ family. Eleni, as I mentioned before, if I’m not mistaken, I am not aware of you being banned from commenting on Kathimerini. I’m glad to say that I have now got hold of a copy of your father’s book and look forward to reading it. Though this was not the intention, for me the book illustrates the problem sons face living up to famous fathers…’Georgaki’ for example. Unlike Georgaki his generation left high school early to plunge into the 2nd world war, followed by the civil war, and in my father’s case the Korean war. A generation that found itself well into their 30s and early 40s before knowing what peace was or could be. Which makes our well-protected lives seem surreal, and the recent decades – now behind us – retrospectively “a waste of spirit in an expense of shame”. Macropolis is great, so best of luck!